Including the dimension of time is an interesting concept in Google Earth. Layers can be added to show the development of a city over years, months, decades or even centuries. As such we thought it would be interesting to introduce some of London’s lost architecture back to the landscape – starting off with the Skylon. 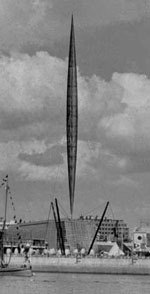 The Skylon, designed by Philip Powell and Hildalgo Moya, became the centre point of the Festival of Britain on the South Bank of London in 1951. Its design was suitably abstract and iconic giving a glimpse of the future to post 2nd World War Britain. It was hugely popular and in some ways provides a glimpse back to how things should be done when viewed in comparison with Britain’s millennium celebrations and architecture such as the Millennium Dome. The Festival of Britain and the Skylon became a centre piece on the South Bank of London, similar to the way the London Eye is today. Sadly it was demolished in 1952 by the Conservative Government and the site is now occupied by the National Theatre. 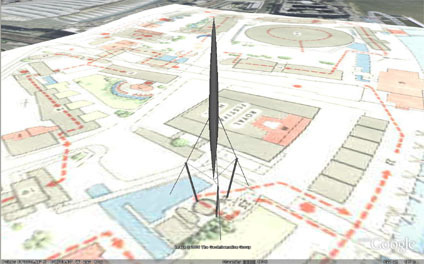 Using Google Earth though it is possible to reconstruct the simple geometry and place it back on the skyline. With the addition of an overlay showing the original site plans for the Festival of Britain (courtesy of The Festival of Britain site) the scale of the Festival can be appreciated. 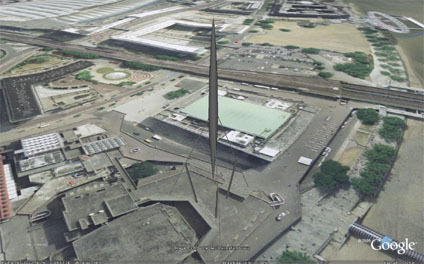 The position of the Skylon was not in the position shown on your plan.It was on the upstream side of Hungerford Bridge, between the Dome and the river. You can see the correct position of Skylon on the plan shown; see the dome at the top of the picture, cast your eyes in a 4 o’clock direction and you’ll come to a small black circle with three lines projecting from it 120 degrees apart. THAT’s where Skylon should be!